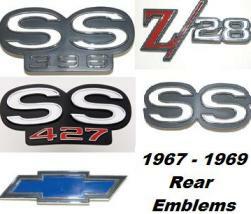 1967 - 1969 Rear Emblems MANY STYLES TO CHOOSE FROM! New replacement rear emblem for 1967 - 1969 Camaro. Many styles to choose from! New replacement rear emblem for 1967 - 1969 Camaro. All units are produced in the USA and are not cheap reproductions found elsewhere. These are the best in the industry. Use the drop down menu to select year and style desired. As you change your selection the image will change showing you exactly that emblem!